Looking for the right propane for your application? 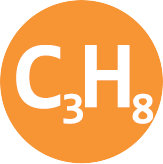 Propane (C3H8) is a colorless and highly flammable liquefied gas. Along with butane, propane is one of the main components in liquid petroleum gas (LPG). Clean burning characteristics make propane ideal for a wide range of industrial and agricultural applications. Please see the table below for information and to access safety data sheets propane available from WestAir. In a specialty gas mixture, propane can be used to calibrate process control analyzers in the oil and gas industries. Other applications include testing of gas burners and engines and calibrating gas mixtures. We deliver gaseous and compressed propane in a variety of cylinders and mixtures to fit your precise application needs.